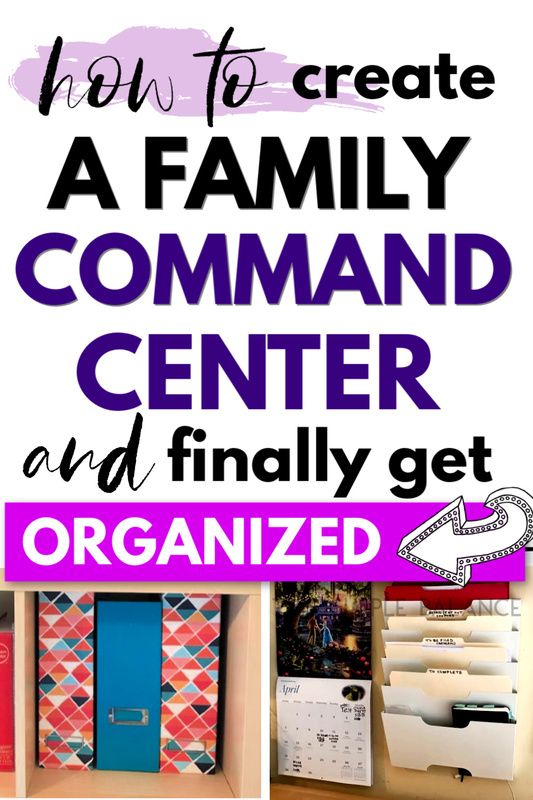 Inside: The ultimate guide to building a DIY family command center, from what to include, family command center must-haves and bonus items, family command center ideas and examples, and more! When I went into full nesting mode last year, I finally decided I’d had enough of our big family’s chaos. Our family calendar was getting more and more complicated due to multiple doctor appointments and homeschool meet-ups. 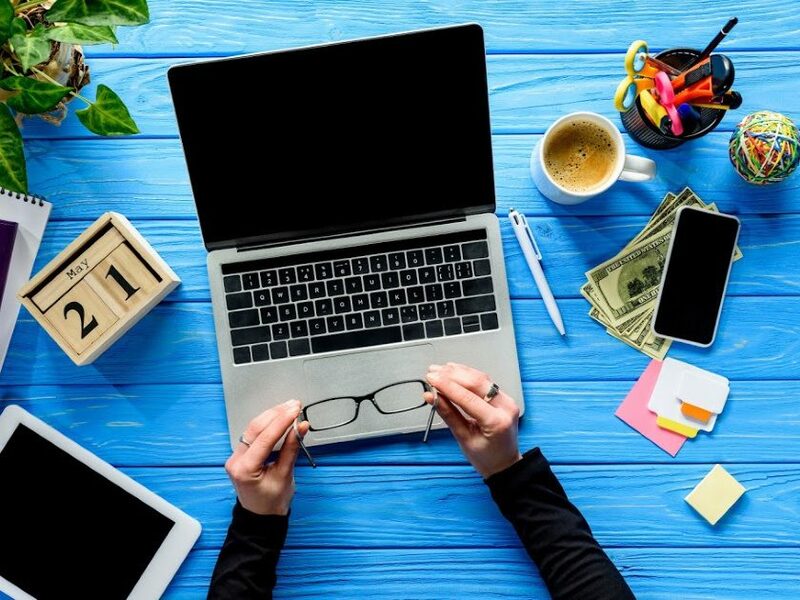 Motherhood, homeschooling, and trying to run a business in the middle of all of that got the better of me last year, and I wasn’t nearly as organized as I wanted to be. That disorganization had a HUGE negative effect on me as a mom. I lived with a constant low level of anxiety, always feeling like I was forgetting something. I was keeping so many things in my head, which helps absolutely no one, including me. It was all swirling around my brain (and my kitchen), sometimes making its way to the note pad on my phone or my bullet journal. But there was nothing tying it all together. I needed a way to keep track of it all, in a way that made sense to everyone else in the family, too. I knew I needed to get.it.together and create a family command center with simple systems for organizing our growing family. What Is a Family Command Center? I explained what I meant, and he nodded along. But I do admit, when you say it out loud or even search for pictures, you sometimes come up with space station type photos. So what is a family command center? A family command center is a way to organize in one place everything your family needs to run smoothly. I will, however, add one caveat to the “one place” part of this definition. If you live in a small home, like I do, you may need to break up parts of your command center. You may not have a huge wall you can dedicate to everything I detail in this post. If that’s you, don’t worry! You can still create a family command center. You just need to think creatively, consider your family’s habits, and determine what makes the most sense for your lifestyle. Disorganization and clutter causes stress. When you can’t find things and are frazzled because you missed appointments, you’re living with constant stress and anxiety. Moms especially tend to keep running lists in their head all the time, which leads to overwhelm and burn out. 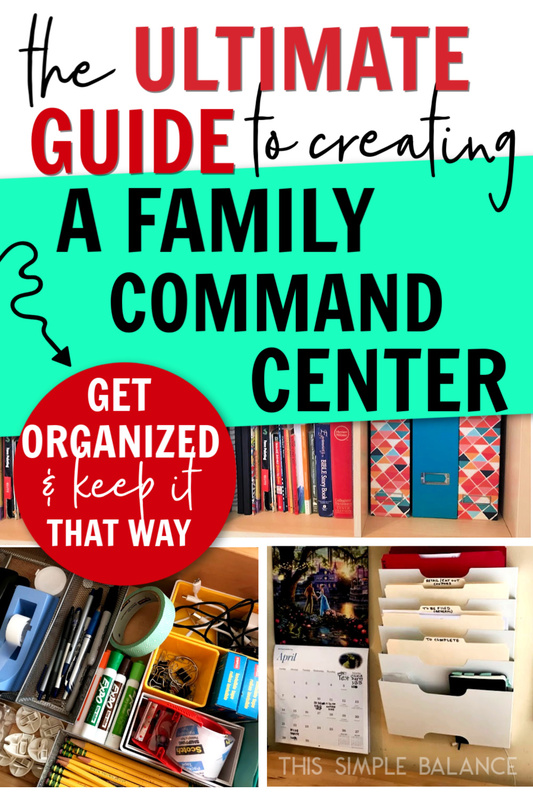 If you are still desperately trying to keep it all together in your head and in the random stacks of paper all over the kitchen counter, you need to pull together a family command center ASAP. After creating our DIY family command center, I no longer have that stressed, anxious feeling, the one where you think you’re forgetting to pay a bill or you lost an important paper or you’re going to miss an appointment. I know exactly where and when everything is. Anxiety keeps moms up at night, and you need your sleep, mama! When you live in a constant state of stress and anxiety, you are unlikely to stick to a meal plan or a budget. Misplacing important documents and missing appointments can add up pretty quickly as you can incur additional fees. At a glance, I can tell what’s happening today, next week, this month. I know what bills are due soon, and I have a place to put things that need to be filed. I can’t guarantee you’ll save thousands, but organization will absolutely save you money. The $25 it takes to create one will save you at least that much in no time at all. You don’t need an expensive Pottery Barn system, though if it makes you happy and you can afford it, by all means go for it. You can assemble a simple, DIY family command center for around $25. Over time, you can add additional items as needed to make keeping everything organized even easier. Have you ever spent hours looking for your keys or a receipt? The average American spends 2.5 days a year – yes, entire days – looking for lost items (source). Invest a little time to create a family command center will save you SO much time in the future! In an increasingly digital world, it’s tempting to skip creating a family command center. I know couples who use Google calendar to keep track of their family’s busy schedule. They sync their phones so they both know what’s going on. Other friends use Trello to keep it all together. There’s nothing wrong with using apps in addition to your physical family command center. I still record appointments on Google calendar for reminders and to keep a record until I have a chance to transfer it to our main calendar. But online calendars can’t beat seeing on the wall, at a glance, what’s going on today. And I know I’m not the only mom wanting to break bad phone habits. Being able to look at a physical calendar while I make my coffee in the morning keeps me from getting distracted on my phone first thing. Digital organization also doesn’t give you a way to manage all the paper that comes with having a family. With kids, I am pretty sure it’s impossible to go completely digital. And even if you did manage to convert your paper into digital files, you still have the paper to begin with and it has to go somewhere. Many families I know keep their family command center in the kitchen. As the heart of the home, it’s where everyone comes first thing in the morning and where kids come right after school. To me, the kitchen is the most logical place. But I don’t live in your home, and I’ve lived in enough tiny homes to know that sometimes you need to get creative. Choose a place that works best and makes the most sense to YOU. If you have a large entryway or a long hallway that leads from the front door to the kitchen, those could be ideal places for your family command center. You also need to make sure you have enough space for everything you want to include (see next section). Ultimately, the most important question to consider is, “Will my family see this?” And will you see it, for that matter. If no one lays eyes on your family command center for days, you might as well not even have one. So choose a place where everyone will see it multiple times a day. Finally, consider whether you want to make your command center kid accessible in every way, or not. If you homeschool and your kids are home all the time, you may want to consider creating something for them as well. You could make your kids a separate command center of their own or make your primary family command center accessible to little ones. Once you decide on a location, you can start to think through what to include and what family command center supplies you will need. You need a basic calendar to keep track of appointments and important events. It doesn’t need to be fancy. However, if you have a big family or a busy family and you are constantly trying to fit multiple events into one tiny calendar square, you may want to consider something bigger, like this whiteboard calendar. This can be a cost-effective option, too, since you won’t need to buy a new calendar every year. Whatever you decide, you need something big enough to keep the entire family’s events in one place. You also need a clock in close proximity to your family command center; it needs to be in your line of site at least. Again, I wish we had one huge wall where I could keep all these things in one place. If you do, go for it! You need a way to keep track of all the papers coming in and out of your home. This is paper’s first stop, a gatekeeper of sorts before the important papers make their way to your file box or filing cabinet. I love our IKEA wall file organizer (you can get it HERE if you don’t have an IKEA nearby). It has enough slots for our needs, but if you have multiple kids in school or other important things to keep track of, like health documents, you might need two sets to hang side by side. 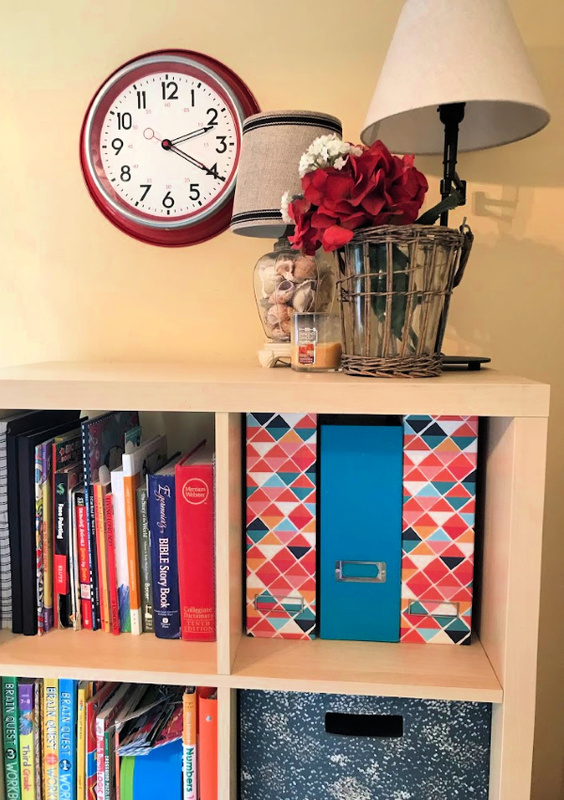 Other options if you are creating your family command center in a cabinet or on shelves are a file box like this one or a magazine holder in this size. You will also need file folders for effective sorting and labeling. Two additional things to keep close by are a recycling bin for junk mail and a shredder for documents you no longer need to keep that have confidential/sensitive information in them. If you don’t want to buy a shredder, you can simply keep another bin for those documents and bring them all to Staples to shred at a later date. Should You Store School Papers in Your Family Command Center? If you are short on space, I do not recommend storing school papers such as worksheets and tests in your family command center long-term unless they are documents to fill out and return or to file. Things like permission slips, immunization forms, and reading charts can be kept in the “To Complete” or “To File” file folder until they are returned to the school. School papers such as art and worksheets should be stored separately from your paper organizer. If you have a sentimental child, you can get a large basket in which to store all the artwork and worksheets and tests that get sent home over the course of the school year. Then at the end of the year, you can sort through everything and clearly see the best pieces that are worth keeping long-term. If your child is not sentimental, simply recycle most papers and place any outstanding artwork in the “to file” folder or put file it right away. If you do have room to keep these baskets near the family command center – on a shelf underneath, perhaps – then by all means, do it. The more you can make your family command center a one stop shop for organizing all things paper, the better. 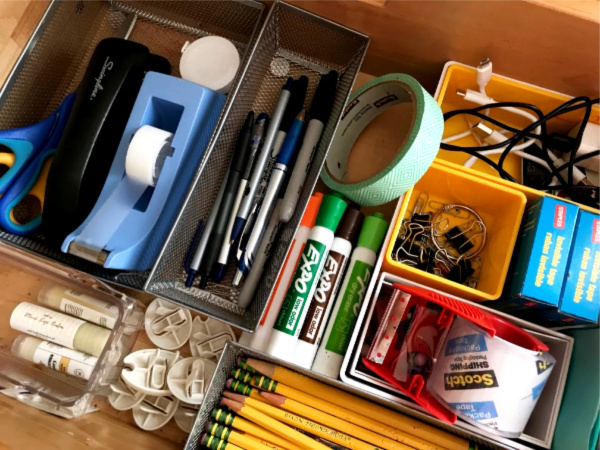 If you are keeping your office supplies organized in drawers, consider buying a simple drawer sorter. If they are organized on a shelf, mason jars of various sizes work well. You can purchase these new or find them in thrift stores. Beyond the basics, here are things that are nice to have depending on your needs. Remember, you need to consider anything else you want to keep organized in a central location. Do you have pool passes you need to keep track off? Do you want to keep your meal plan visible (not buried away in a planner somewhere)? A small bulletin board could help, but if you do decide to include a bulletin board, be careful. Just like on flat surfaces, don’t let your bulletin board become a catch-all for all the things your family doesn’t know what to do with. You won’t be able to separate the important from the unimportant, which has the opposite effect you’re going for. 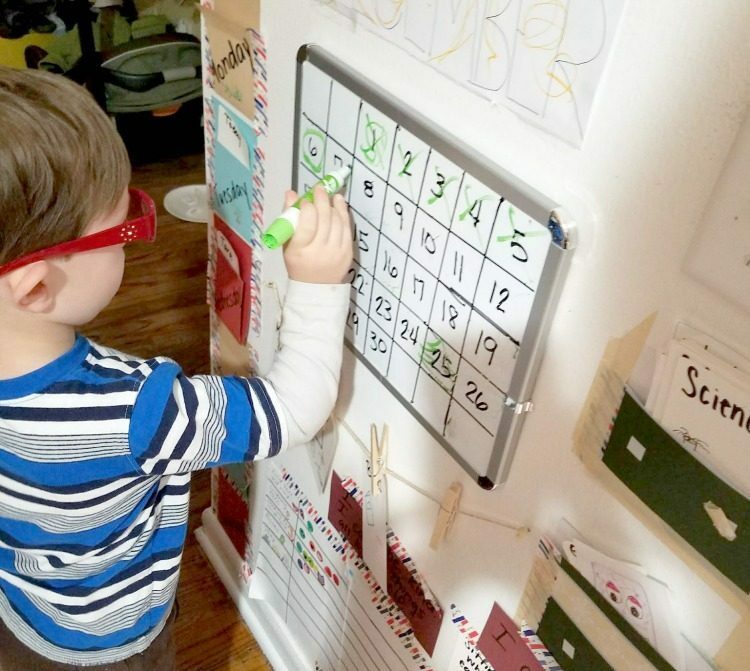 You fill in the blank, but if you have extra things like these and prefer magnets and dry erase markers to push pins and papers, go with the white board or magnetic chalk board like this one. If you decide to take this approach, consider whether you want all of those things on one big white board, or if would rather hang 2-4 separate smaller boards in a grid to keep everything separate and not risk confusion and mix-ups. Clipboards are another alternative to bulletin boards if you want to use paper schedules or lists and change them out on a regular basis. Most clipboards can easily be mounted to the wall. At this point, we don’t have a big enough space to keep a full blown charging station in our family command center, though I hope to one day. For now, I do keep two chargers for my phone and our iPad threaded through the last file folder slot in our IKEA rack (where I also keep my bullet journal). When we do have the space, I plan on purchasing something like this. Cords everywhere drive me crazy! As I was decluttering all of our papers the other day, I came across several unopened paycheck stubs. I could have really used a letter opener at the time. If you open multiple bills and letters a day, a letter opener is a fun item to have. After all, dealing with paper is not the most fun thing in the world. Anything that makes it fun (and prevents paper cuts) is worth adding to your family command center eventually. If you have a busy family with everyone going in different directions every morning and at different times as well (I imagine this is how life will look with teenagers), including a message board in your family command center can be helpful, possibly even essential. Leave notes for each other about what time dinner is that evening and/or reminders about the day’s events (e.g. mom’s working late tonight or your brother has a soccer game at this time). As I mentioned earlier, chalk boards or white boards tend to work best for messages. 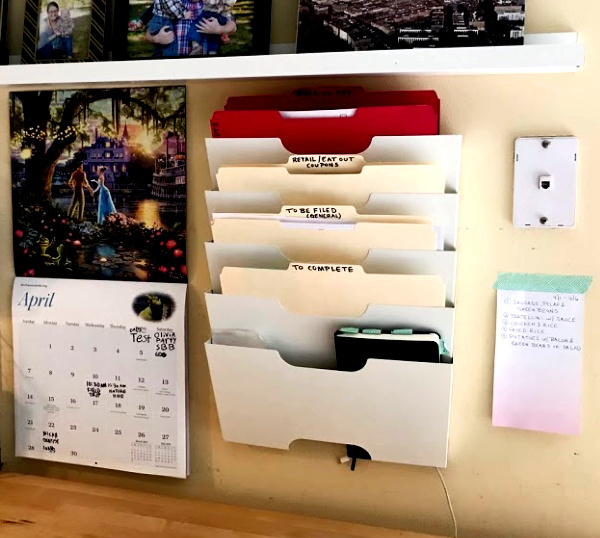 If you are someone who loves printables and tracking things on physical paper, consider adding a binder to your family command center. Grab a three-hole punch and include things you want to reference on a regular basis. Think cleaning schedules, homeschool documentation, and recipes you want to refer to. If your family command center is closer to your front door, you might consider keeping a tray or hooks for keys and wallets. The more you can keep all the important things in one place, the better. This doesn’t work for all homes or family command centers if you don’t have the space. Do what makes sense for your space and your habits. If you are constantly forgetting to grab your keys from the family command center in the kitchen, keep them right by the front door instead. If you decided to set up your family command center in your entryway, you should also include hooks for backpacks and coats or sweatshirts. A bench is another nice thing to have if you use the entryway location. However, it can easily become another clutter magnet. When you first set up your family command center, make sure everyone in the family knows which hook(s) is his and where every single one of his belongings “lives”. Make sure they have complete clarity or everything will end up on the bench (ask me how I know). Baskets can be stored underneath to house shoes or winter gear. Make sure to keep a boot tray nearby for rainboots and snow boots. Another nice extra to have in your family command center is inspiration. Framed artwork can be fun, but my vote would be for the inspiring or motivating quotes. Letterboards like this one are extremely popular these days and for good reason: you can change it daily, weekly, monthly or whenever suits your family. You could have your family motto, memory verse, or another quote that inspires you. If you are on a tight budget, IKEA has several great options to assemble a family command center for less. In fact, seeing this wall rack in another post inspired my own family command center. You can add a Dollar Store or printable calendar and file folders for a couple dollars. You could also easily find similar items at your local thrift store if you need to save even more. In my family command center, I use a simple tear-off list sheet to write down weekly meals and tape it to the wall using this masking tape. I don’t have much space left for a clipboard or whiteboard on the wall I’m using, so simplicity (and frugality) wins. Because we live in a small house, I needed to break up my family command center into sections. For bills, I will add a post-it note with the date the bill is due and place it so I can see it peeking out of the file folder. However, increasingly I am paying bills as soon as I receive them, which really simplifies my life! Work my kids have done that I need to keep as samples for our homeschool records I keep in magazine racks: one per child. Later on, we sort through them and keep them in binders, although I think eventually, I will need to transition this to a file box on some kind with folders by year per child. Papers we need to keep long-term – taxes, important documents, car repair documentation, etc. – we store in a file box in our bedroom, up and out of reach of little hands. We also store kid’s artwork upstairs, away from kids, in large boxes like this one. Because our entryway is so small – practically non-existent – and because we rent and I loathe putting more holes in the wall that we will have to fill later, we currently use simple dishes for our keys and wallets. My husband and I each have a separate one in the bookshelf in our living room. Our command center is certainly not the prettiest out there, but it works for us. You can follow my “Family Command Center Ideas” Board on Pinterest for more inspiration and ideas! Once you have your family command center set up, you’ve done most of the hard work. You just need to make sure to declutter and maintain your family command center on a regular basis. You will also need replace your calendar annually. Finally, the biggest enemy of your family command center is ineffective systems for dealing with paper. One way to make paper clutter less of a problem is to reduce the amount coming into your home in the first place. You can read several effective ways to cut down on the inflow of paper clutter in this post. Once you have your family command center put together in one place, you can breathe a huge sigh of relief. That’s what I did! Creating a family command center was one of the best things I did for myself in 2018. I have A LOT going on, and I know you do, too. As moms, we are almost always the ones holding everything in our family together (though there are dads out there rocking that role, too). Our families need us to stay sane. And we can’t stay sane if we’re pulling our hair out because we missed that appointment or lost that important piece of paper. So don’t wait to put together a family command center. Stop what you’re doing and order everything you need to put this together ASAP. Your family command center will keep you organized, so you can save your brain power for bigger and better things. Sound good? Awesome – go get started! Thank you for this post! I have been working on decluttering our home for the past couple of years, and reading your post yesterday morning gave me the inspiration to get started on my own command center. I now have my homeschool planner, bill binder, meal plan and recipes all in one location, and even put away enough random office stuff yesterday that I have an old desk I can’t wait to get my husband to drag out of our room. Thanks again!